"The Feast of All Saints" redirects here. For the 1978 novel by Anne Rice, see The Feast of All Saints (novel). All Saints' Day, also known as All Hallows' Day, Hallowmas, the Feast of All Saints, or Solemnity of All Saints, is a Christian festival celebrated in honour of all the saints, known and unknown. In Western Christianity, it is celebrated on 1 November by the Roman Catholic Church, the Anglican Communion, the Methodist Church, the Church of the Nazarene, the Lutheran Church, the Reformed Church, and other Protestant churches. The Eastern Orthodox Church and associated Eastern Catholic Churches and Byzantine Lutheran Churches celebrate it on the first Sunday after Pentecost. Oriental Orthodox churches of Chaldea and associated Eastern Catholic churches celebrate All Saints' Day on the first Friday after Easter. In the Western Christian practice, the liturgical celebration begins at Vespers on the evening of 31 October, All Hallows' Eve (All Saints' Eve), and ends at the close of 1 November. It is thus the day before All Souls' Day, which commemorates the faithful departed. In many traditions, All Saints' Day is part of the season of Allhallowtide, which includes the three days from 31 October to 2 November inclusive and in some denominations, such as Anglicanism, extends to Remembrance Sunday. On All Saints Day, it is common for families to attend church, as well as visit cemeteries in order to lay flowers and candles on the graves of their deceased loved ones. In Austria and Germany, godparents gift their godchildren Allerheiligenstriezel (All Saint's Braid) on All Saint's Day, while the practice of souling remains popular in Portugal. It is a national holiday in many historically Christian countries. The Christian celebration of All Saints' Day and All Souls' Day stems from a belief that there is a powerful spiritual bond between those in heaven (the "Church triumphant"), and the living (the "Church militant"). In Catholic theology, the day commemorates all those who have attained the beatific vision in Heaven. In Methodist theology, All Saints Day revolves around "giving God solemn thanks for the lives and deaths of his saints", including those who are "famous or obscure". As such, individuals throughout the Church Universal are honoured, such as Paul the Apostle, Augustine of Hippo and John Wesley, in addition to individuals who have personally led one to faith in Jesus, such as one's grandmother or friend. In the British Isles, it is known that churches were already celebrating All Saints on 1 November at the beginning of the 8th century to coincide with or replace the Celtic festival of Samhain. James Frazer suggests that 1 November was chosen because it was the date of the Celtic festival of the dead (Samhain). However, Ronald Hutton points out that, according to Óengus of Tallaght (d. ca. 824), the 7th/8th century church in Ireland celebrated All Saints on 20 April. He suggests that 1 November date was a Germanic rather than a Celtic idea. The celebration of 1 November in Lebanon as a holiday is simply the influence of Western Catholic orders present in Lebanon and is not Maronite in origin. The traditional Maronite feast equivalent to the honor of all saints in their liturgical calendar is one of three Sundays in preparation for Lent called the Sunday of the Righteous and the Just. The following Sunday is the Sunday of the Faithful Departed (similar to All Souls Day in Western calendar). The Christian holiday of All Saints' Day falls on 1 November, followed by All Souls' Day on 2 November, and is currently a Solemnity in the Roman Rite of the Catholic Church, a Festival in the Lutheran Churches, as well as a Principal Feast of the Anglican Communion. In the early days the Christians were accustomed to solemnise the anniversary of a martyr's death for Christ at the place of martyrdom. In the 4th century, neighbouring dioceses began to interchange feasts, to transfer relics, to divide them, and to join in a common feast; as is shown by the invitation of St. Basil of Caesarea (397) to the bishops of the province of Pontus. In the persecution of Diocletian the number of martyrs became so great that a separate day could not be assigned to each. But the Church, feeling that every martyr should be venerated, appointed a common day for all. The first trace of this we find in Antioch on the Sunday after Pentecost. We also find mention of a common day in a sermon of St. Ephrem the Syrian (373), and in the 74th homily of St. John Chrysostom (407). According to Ephrem, this feast was observed at Edessa on 13 May, and John Chrysostom says it was on the Sunday after Pentecost in Constantinople. As early as 411 there is in the Chaldean Calendar a "Commemoratio Confessorum" for the Friday after Easter. On 13 May 609 or 610, Pope Boniface IV consecrated the Pantheon at Rome to the Blessed Virgin and all the martyrs, ordering an anniversary; the feast of the dedication Sanctae Mariae ad Martyres has been celebrated at Rome ever since. There is evidence that from the 5th to the 7th centuries there existed in certain places and at sporadic intervals a feast date on 13 May to celebrate the holy martyrs. The origin of All Saints' Day cannot be traced with certainty, and it has been observed on various days in different places. However, there are some who maintain the belief that it has origins in the pagan observation of 13 May, the Feast of the Lemures, in which the malevolent and restless spirits of the dead were propitiated. Some liturgiologists base the idea that this Lemuria festival was the origin of that of All Saints on their identical dates and on the similar theme of "all the dead". Meanwhile, others consider that 13 May was perhaps deliberately chosen by the Pope because of its celebration already established in the East. 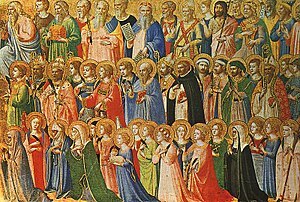 The feast of All Saints, on its current date, is traced to the foundation by Pope Gregory III (731–741) of an oratory in St. Peter's for the relics "of the holy apostles and of all saints, martyrs and confessors, of all the just made perfect who are at rest throughout the world", with the date moved to 1 November and 13 May feast suppressed. Protestants disagree with the idea of saints as understood in the Roman Catholic tradition, and generally commemorate all Christians on All Saints' Day; if they observe All Saints Day at all, they use it to remember all Christians both past and present. In the United Methodist Church, All Saints' Day is celebrated on the first Sunday in November. It is held, not only to remember Saints, but also to remember all those who have died who were members of the local church congregation. In some congregations, a candle is lit by the Acolyte as each person's name is called out by the clergy. Prayers and responsive readings may accompany the event. Often, the names of those who have died in the past year are affixed to a memorial plaque. In many Lutheran churches, All Saints' Day is celebrated the Sunday after Reformation is celebrated (the date for Reformation is 31 October, so Reformation Sunday is celebrated on or before 31 October). In most congregations, the festival is marked as an occasion to remember the dead. The names of those who have died from the congregation within the last year are read during worship and a bell is tolled, a chime is played or a candle is lit for each name read. While the dead are solemnly remembered during worship on All Saints' Sunday, the festival is ultimately a celebration of Christ's victory over death. In English-speaking countries, services often include the singing of the traditional hymn "For All the Saints" by Walsham How. The most familiar tune for this hymn is Sine Nomine by Ralph Vaughan Williams. Other hymns that are popularly sung during corporate worship on this day are "I Sing a Song of the Saints of God" and "Ye Watchers and Ye Holy Ones". In some countries, All Saints' Day is a public holiday, but All Souls' Day is not. Consequently, people will visit the cemetery on All Saints. In Bosnia and Herzegovina, Croatia, the Czech Republic, Finland, Catholic parts of Germany, Hungary, Italy, Lithuania, Macedonia, Moldova, Poland, Romania, Slovakia, Slovenia, Serbia, and Sweden the tradition is to light candles and visit the graves of deceased relatives. In Austria and Bavaria it is customary on All Saints' Day for godfathers to give their godchildren Allerheiligenstriezel, a braided yeast pastry. In France, and throughout the Francophone world, the day is known as La Toussaint. Flowers (especially in Chrysanthemums), or wreaths called 'couronnes de toussaints' are placed at each tomb or grave. The following day, 2 November (All Souls' Day) is called Le jour des morts, the Day of the Dead. In Belgium, "Toussaint" is a public holiday. Belgians will visit the cemetery to place chrysanthemums on the graves of deceased relatives on All Saints Day since All Souls is not a holiday. In Portugal, Dia de Todos os Santos is a national holiday. Families remember their dead with religious observances and visits to the cemetery. Portuguese children celebrate the Pão-por-Deus tradition (also called santorinho, bolinho or fiéis de Deus) going door-to-door, where they receive cakes, nuts, pomegranates, sweets and candies. In Spain, el Día de Todos los Santos is a national holiday. The play Don Juan Tenorio is traditionally performed. In Argentina, Bolivia, Chile, Peru, Puerto Rico, Uruguay and the state of Louisiana, people take flowers to the graves of dead relatives. All Saints' Day in Mexico coincides with the first day of the Day of the Dead (Día de Muertos) celebration. It commemorates children who have died (Dia de los Inocentes) and the second day celebrates all deceased adults. In Guatemala, All Saints' Day is a national holiday. On that day Guatemalans make a special meal called fiambre which is made of cold meats and vegetables; it is customary to visit cemeteries and to leave some of the fiambre for their dead. It is also customary to fly kites to help unite the dead with the living. There are festivals in towns like Santiago Sacatepéquez and Sumpango, where giant colorful kites are flown. Hallow-mas in the Philippines is variously called "Undás", "Todos los Santos" (Spanish, "All Saints"), and sometimes "Araw ng mga Patay / Yumao" (Tagalog, "Day of the dead / those who have passed away"), which actually refers to the following day of All Souls' Day but includes it. Filipinos traditionally observe this day by visiting the family dead to clean and repair their tombs. Offerings of prayers, flowers, candles, and even food, while Chinese Filipinos additionally burn incense and kim. Many also spend the day and ensuing night holding reunions at the cemetery, having feasts and merriment. Though Halloween has usually been seen as an American influence in the Philippines, the country's trick-or-treat traditions during Undas (from the Spanish "Hondras") are actually much older. This tradition was derived from the pre-colonial tradition called pangangaluwa. Pangangaluluwa (from "kaluluwa" or spirit double) was a practice of early Filipinos who sang from house to house swathed in blankets pretending to be ghosts of ancestors. If the owner of the house failed to give biko or rice cakes to the "nangangaluluwa", the "spirits" would play tricks (try to steal slippers or other objects left outside the house by members of the family or run off with the owner's chickens). This pre-colonial practice is still seen in rural areas. During Undas, family members visit the cemetery where the body of the loved ones rest. It is believed that by going to the cemetery and offering food, candles, flowers, and sometimes incense sticks, the spirit of the loved one is remembered and appeased. Contrary to common belief, this visitation practice is not an imported tradition. Prior to the establishment of coffins, pre-colonial Filipinos were already practicing such a tradition of visiting burial caves throughout the archipelago as confirmed by a research conducted by the University of the Philippines. The tradition of "atang" or "hain" is also practiced, where food and other offerings are placed near the grave site. If the family cannot go to the grave site, a specific area in the house is provided for the offering. The exact date of Undas today, 1 November, is not a pre-colonial observance date but an influence from Mexico, where the same day is known as the Day of the Dead. Pre-colonial Filipinos preferred going to the burial caves of the departed occasionally as they believed that aswang (half-vampire half-werewolf beings) would take the corpse of the dead if the body was not properly guarded. The protection of the body of the loved one is called "paglalamay". However, in some communities, this paglalamay tradition is non-existent and is replaced by other pre-colonial traditions unique to each community. The Undas is also seen as a family reunion, where family members coming from various regions go back to their hometown to visit the grave of loved ones. Family members are expected to remain beside the grave for the entire day and socialize with each other to mend bonds and enhance family relations. In some cases, family members going to certain burial sites exceed one hundred people. Fighting in any form is prohibited during Undas. Children have important roles during Undas. Children are allowed to play with melted candles in front of grave sites and turn the melted wax from the candles into round wax balls. The round balls of wax symbolize the affirmation that everything goes back to where it began, as the living will go back to ash, where everything started. In some cases, families also light candles at the front door of the home. The number of candles is equivalent to the number of departed loved ones. It is believed that this tradition aids departed loved ones and provide them with a happy path to the afterlife. ^ Willimon, William H. (2007). United Methodist Beliefs. Westminster John Knox Press. p. 64. ISBN 978-1611640618. Retrieved 30 October 2014. ^ The Shakespeare Name Dictionary. Routledge. 2004. ISBN 978-1135875718. Retrieved 30 October 2014. ^ The Anglican Service Book. Good Shepherd Press. 1 September 1991. p. 677. ISBN 978-0962995507. Retrieved 3 November 2012. ^ St. John of Shanghai and San Francisco. "Homily on the Feast of All Saints of Russia". St. John Chrysostom Orthodox Church. ^ "Celebrations and Observances of the Church Year". www.thefoundrypublishing.com. Retrieved 25 April 2019. ^ Sidhu, Salatiel; Baldovin, John Francis (5 February 2013). Holidays and Rituals of Jews and Christians. p. 193. ISBN 978-1481711401. Lutheran and Orthodox Churches who do not call themselves Roman Catholic Churches have maintained the traditions of the Roman Catholic Church, still celebrate this Day. Even the Protestant Churches like the United Methodist Church all celebrate this day as the All Souls Day and call it All Saints day. ^ a b "Syro Malabar Liturgical Calendar 2016" (PDF). ^ Leslie, Frank (1895). Frank Leslie's Popular Monthly. Allhallowtide. Frank Leslie Publishing House. p. 539. Retrieved 9 April 2014. Just as the term "Eastertide" expresses for us the whole of the church services and ancient customs attached to the festival of Easter, from Palm Sunday until Easter Monday, so does All-hallowtide include for us all the various customs, obsolete and still observed, of Halloween, All Saints' and All Souls' Days. From the 31st of October until the morning of the 3d of November, this period of three days, known as All-hallowtide, is full of traditional and legendary lore. ^ Hatch, Jane M. (1978). The American Book of Days. Wilson. p. 979. ISBN 978-0824205935. ^ Williams, Victoria (2016). Celebrating Life Customs around the World. ABC-CLIO. p. 979. ^ Guillain, Charlotte (2014). Portugal. Capstone. ^ a b Iovino, Joe (28 October 2015). "All Saints Day: A holy day John Wesley loved". The United Methodist Church. Retrieved 20 October 2016. ^ Pseudo-Bede, Homiliae subdititiae; John Hennig, 'The Meaning of All the Saints', Mediaeval Studies 10 (1948), 147–61. ^ "All Saints Day", The Oxford Dictionary of the Christian Church, 3rd edition, ed. E. A. Livingstone (Oxford: Oxford University Press, 1997), 41–42; The New Catholic Encyclopedia, eo.loc. ^ Hennig, John (1946). "A Feast of All the Saints of Europe". Speculum. 21 (1): 49–66. JSTOR 2856837. ^ Downey 1956, pp. 301–305. ^ a b Mershman, Francis (1907). "All Saints' Day". The Catholic Encyclopedia. Vol. 1. New York: Robert Appleton Company. Retrieved 30 October 2014. ^ C. Smith The New Catholic Encyclopedia 1967: s.v. "Feast of All Saints", p. 318. ^ For example, Violet Alford ("The Cat Saint", Folklore 52.3 [September 1941:161–183] p. 181 note 56) observes that "Saints were often confounded with the Lares or Dead. Repasts for both were prepared in early Christian times, and All Saints' Day was transferred in 835 to November 1st from one of the days in May which were the old Lemuralia"; Alford notes Pierre Saintyves, Les saints successeurs des dieux, Paris 1906 (sic, i.e. 1907). ^ Saunders, William. "All Saints and All Souls". catholiceducation.org. Retrieved 18 September 2016. ^ Hutton, Ronald (1996). Stations of the Sun: A History of the Ritual Year in Britain. New York: Oxford Paperbacks. ISBN 0192854488. ^ Cruz, Elfren S. (31 October 2013). "Undas in Filipino culture". The Philippine Star. Retrieved 17 February 2018. ^ Miaco, Mimi (29 October 2015). "10 Things Pinoys Do During Undas". Spot. Retrieved 6 December 2018. This article incorporates text from a publication now in the public domain: Chisholm, Hugh, ed. (1911). "All Saints, Festival of" . Encyclopædia Britannica. 1 (11th ed.). Cambridge University Press. This page was last edited on 25 April 2019, at 17:35 (UTC).